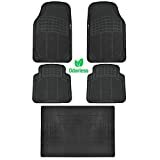 MotorTrend® Set of 5 Premium Heavy Duty Rubber Car Floor Mats for front,rear, and cargo or trunk placements. Featuring odorless and flexible 100% rubber material. Does not crack or deform under pressure or extreme temperatures. The heavy duty construction allows the mat to retain it’s shape overtime. Each mat is equipped with non-skid rubber needle backing for traction. When properly installed, our premium MotorTrend® mats won’t curl under the pedal. Protecting your Mazda 3 Hatch flooring is our business. The grooves and ridges are engineered to easily protect your flooring against snow, water, liquid, dirt, loose gravel, and mud. Available in 3 select colors (Black, Beige, Gray). Extra thick industrial construction for durability trimmable rubber edges. Does not bend overtime.